I nominated your blog for the new blogger Liebster Award.I love reading your posts. Keep sharing! I LOVE your WHALE Cursive alphabet chart...is it on your website or your TPT? I enjoyed reading your site today! Could you send me a copy of your sheets you used for Compare and Contrast. How awesome! I came across your blog today searching for fifth grade writing ideas. I love your compare and contrast lesson and would like to use it next week. Would I be able to get a copy of your worksheets and Halloween stories emailed to me at kwelsh@quaboagrsd.org? Thanks! Hello, I wanted to ask you a question. I love your Literature circles and was wondering where do you get the worksheets to go a long with your posters and pins? Do you sell them? Love your character comprehension packet to. Hi! I follow you on instagram and visit your blog often. This year I am assigned to teach fifth grade. I have previous experience in K,1,2,and 4. My district uses engageny.com common core modules for ELA and Math instruction. My school also received a grant to extend the school day so I would like to focus on reading groups during that time. I was wondering if you had a list or could post pictures of fifth grade read alouds/literature or any educational free websites. I'm very familiar with primary children's literature but need some guidance for the older ones. Keep up all your hard work! I am inspired by your efforts and willingness to continue to be creative and dedicated! Hello! I downloaded your wonderful evidence terms posters and made a banner to go above them. It matches and everything. I would love to share it with you if you'd like, but I didn't know how to send it to you. So, if you're interested, email me at: natiora_00@yahoo.com. Thanks for sharing your great ideas! I love this blog! Hi! I love your genre posters! Can you tell me where you got them? Or did you make them? I would love to have a copy. Thanks! Hello! First of all, you are an awesome teacher. I love everything you post. Could I ask you what your ELA block looks like? I teach 4 different classes daily for 55 minutes each. I'm struggling getting into a daily routine. Your help would be greatly appreciated. Can I just get the ladders?? I love them!! I love your blog and implement many of your ideas. Question- do you use Twitter in your classroom? Would love to connect our classrooms. I can't express enough how much you have helped me to become a better teacher in the past three years! When I found you on TPT I was teaching 1st grade and loved all of your stuff. Then I got a long term 5th grade last year and am again in 5th grade. So happy you are in 5th also :) I have shared many of your ideas with my fellow 5th grade teachers. I am finishing my first round of Lit Circles with my 5th graders. I have separated my kids by reading levels (groups of 4 or 5). I've assigned a different job/week for ea. student. Currently it's taking 5 weeks for them to get though a chapter book. Our academic coach is helping me facilitate the groups when they meet and loves what I'm doing (thanks to you! )Do you do Lit Circles by groups or whole class? I would love if you would blog about how you organize your Lit Circles and how you use the Bloom's Ladder Activities in more detail (weekly/daily?). I'm first year teacher this year with my own 5th grade STEM class! I would love to see your syllabus. I was just hired on friday and my kids come this wednesday. Needless to say I'm scrambling to come up with my first week procedures and expectations. 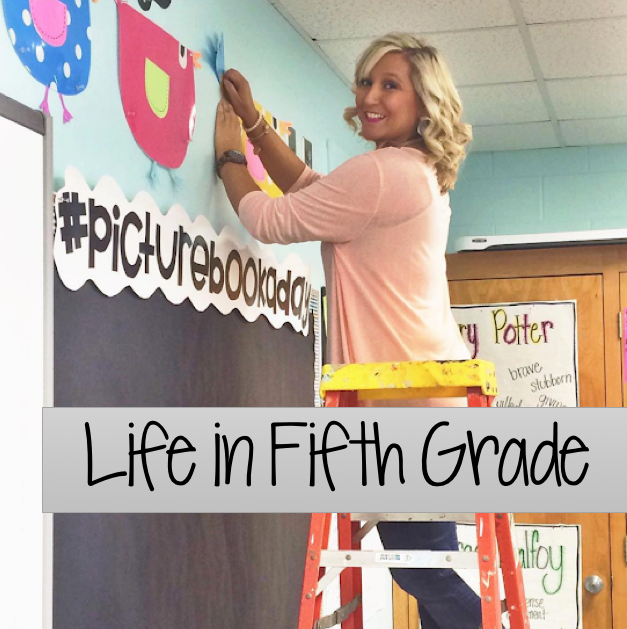 I really enjoy your blog and I'd love to see what you had planned for your classroom your first week! I would like to personally congratulate you as your blog Life in Fifth Grade has been selected by our panelist as one of the Top 30 Fifth Grade Teacher Blogs on the web. I personally give you a high-five and want to thank you for your contribution to this world. This is the most comprehensive list of Top 30 Fifth Grade Teacher Blogs on the internet and I’m honored to have you as part of this!